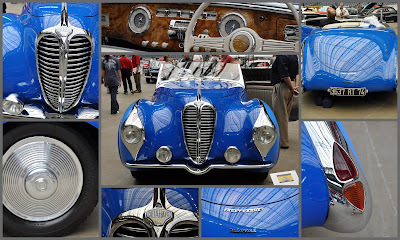 This Morning, I just learned that this 1948 Delahaye 135 MS Faget Varnet Cabriolet, was awarded the 2009 Best in Show at the 2009 Classy Chassis Show here in Houston. This chic little French cabriolet is owned by Cathy & Jerry Gauche, Houston, Texas. Tall Husband and I had attended the 2009 Classy Chassis Show early in the day, during the judging and left before the winners were announced. So this morning, the Best of Show was finally posted on the Classy Chassis website. Congratulations to Cathy & Jerry and thanks for letting us photograph your wonderful car. IT has been a long time since we visited a car show in the summer. Wonderful photos of that blue car! My favorite blue is my Hubbies beloved Mazda Miata that is in that similar blue! Thank you for sharing your afternoon photos with us. It is always a treat to take the time and visit your blog. I know that color of Miata. I had a red Miata, the second year they came out (I waited for an automatic.) I still miss that car.